The Hartley, as it is commonly referred to, was dedicated in the fall of 1994 as the nucleus garden of the Arboretum that incorporated hotricultural instruction, extension and research in floricultural and bedding plants. At the heart of the Arboretum lays the Miles C. Hartley Selections Garden, made possible by a generous gift from the estate, family and friends of alumnus and former UI faculty member Miles C. Hartley. The Hartley is a showcase of hundreds of varieties of flowering plants, including All America Selections and Fleuroselect winners, displayed in row trials and designed beds. Dozens of companies from across the globe provide seed or plants for the Hartley plantings. While focusing primarily on annuals for both sun and shade, the Hartley contains trees and shrubs and is a lovely place to relax on the many benches surrounding the trial flower beds. The Hartley Selections Garden was the first stage in the Arboretum's development. The Hartley is commonly used as a venue for weddings. 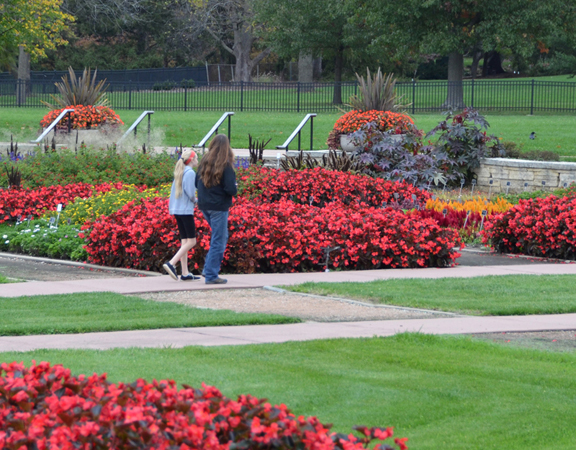 Its sunken gardens with pathways, lathe houses and ornamentals provide a stunning visual for visitors to the Arboretum. Planting typically begins in early June and the flowers are at their peak July through October. Plans are currently underway to redesign the layout of the Hartley and make it more of a four-season garden.